Return from the Lido, 1884, Oil on canvas, Isabella Stewart Gardner Museum; purchased by Isabella Stewart Gardner from the American painter and collector Ralph W. Curtis (1854-1992), Venice for $150 in December 1884. Originating this past summer at the Morgan Library and Museum, the exhibition includes a rich selection of more than 50 oil paintings, drawings, watercolors, photographs, manuscripts, letters, and printed books from 24 museums and private collections in the US, Great Britain, and Ireland. The Gardner Museum will also pay special attention to James’s enduring relationship with Gardner and their circle of mutual friends through archival objects and correspondence drawn from the Museum collection. James, who had a distinctive, almost painterly style of writing, is best known for his books, Portrait of a Lady (1880), Washington Square (1880), The Wings of a Dove (1902), and The Ambassadors (1903). He was part of a creative circle of writers and artists in the late 1800s that were on the move between grand salons and artists' studios in Boston, Florence, London, and Rome. A woman ahead of her time, Gardner was an influential part of the group, and her Museum vividly evokes one city that captivated all of them: Venice. 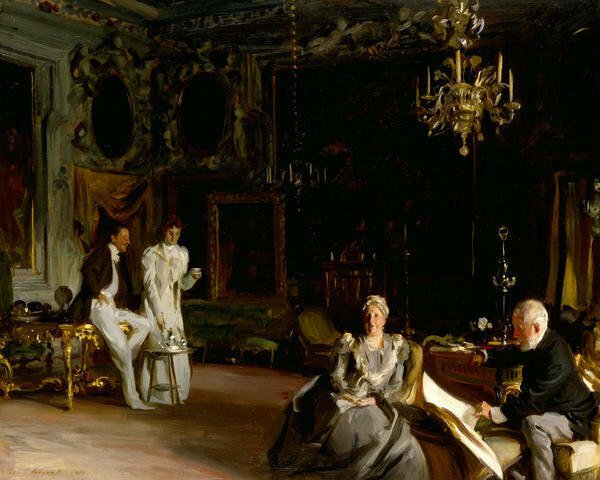 John Singer Sargent's 1889 painting, An Interior in Venice, showcases a palazzo's grand salon and is part of the exhibition, on loan from the Royal Academy of Arts in London.